As expected, Lazarus N from the Jimmy Takter Stable has been tagged as the morning line favorite at odds of 6-5 in the $325,000 Dan Patch Stakes Friday, Aug. 10. The New Zealand bred wonder stallion will be making his first North American start in the Dan Patch Stakes as a late supplement into the race. Even drawing post nine has not deterred the odds for Lazarus N, who was purchased this spring by Taylor Made Stallions, a Thoroughbred breeding business in Kentucky. The five-year-old son of Bettor’s Delight comes to the United States with 35 wins in 45 starts, earning the coveted New Zealand Cup twice in his career. He will begin from post nine with Yannick Gingras in the bike at odds of 6-5. Other horses to watch in the race include four-year-old Beckhams Z Tam from the Jamie Macomber Stable driven by Ricky Macomber Jr. from post two . Although he’s slated at odds of 20-1, the local favorite was a winner last year in the prestigious Breeders Crown at Hoosier Park. McWicked is selected as the second choice on the morning line at odds of 2-1. He will begin his mile from post six with Brian Sears aboard. 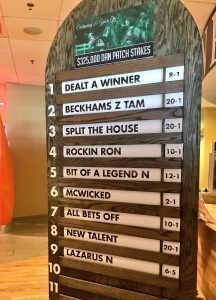 The 25th edition of the Dan Patch Stakes is the 11th race on the Friday program that includes 14 races, including the $25,000 Gregg Haston Memorial, slated as the ninth race on the card. The entire weekend will provide all types of entertainment. The 15th annual Kammy’s Kause Music Festival presented by FoxGardin. The outdoor venue will feature 22 bands. Music begins at 9 p.m. Saturday after racing with music beginning at noon on Sunday. The music festival raises funds for 4p-, also known as Wolf-Hirschhorn syndrome, a generic developmental disorder. In addition to racing and entertainment, the Indiana Standardbred Association is partnering with Hoosier Park for a special handicapping contest with $10,000 in prize money, $5,000 allotted to the winner.